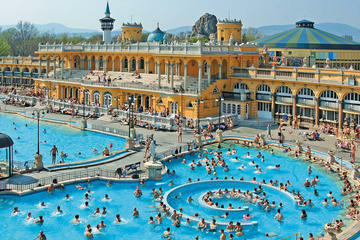 Purchase your ticket ahead of time and skip the main entrance line at Széchenyi Spa, Budapests largest public bath. Enjoy 18 indoor and outdoor pools  most fed by mineral springs  as well as several steam rooms and saunas under Baroque-style domes. With full-day access and use of your own changing cabin, you can swim in the outdoor amusement pool or just relax until closing time. If you like, upgrade your spa entrance with a 20-minute aromatherapy massage.